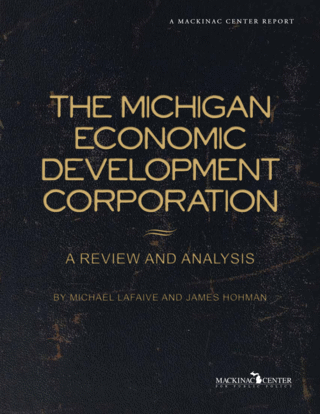 What Is the Michigan Economic Development Corp.? The Michigan Economic Development Corp. is a quasi-public department of state government. It was created by the Engler administration when it issued Executive Order 1999-1 to divide the MEDC's predecessor agency, the Michigan Jobs Commission, into two parts. One component of the order simply said, "The Michigan Department of Career Development is hereby created," and another described how the new Michigan Economic Development Corp. was to come into existence with the help of the "Michigan Strategic Fund." A short digression is necessary to explain the Michigan Strategic Fund and the "interlocal agreement" that led to the MEDC's formation. Prior to the actual creation of each new department, the executive order transferred programs from the Michigan Jobs Commission to the Michigan Strategic Fund. These programs included the Michigan Economic Growth Authority, Michigan Travel Bureau/Travel Michigan, Office of Film and Television Services, and administration of the Michigan Renaissance Zone Act, among others. The Michigan Strategic Fund is an economic development initiative created by Public Act 270 of 1984. In Executive Order 1999-1, the Michigan Strategic Fund was authorized to enter into what is called an "interlocal" agreement with at least one local economic development organization and create a new "public body corporate" to "be called the Michigan Economic Development Corporation." The corporation is governed by a 20-person executive committee. The original interlocal agreement was made effective April 5, 1999. The MSF remains the legal vehicle through which state appropriations are made to support the work of the MEDC. Nevertheless, the MEDC is technically still an independent unit of the state. "This new structure will enable us to have an even quicker, more flexible economic development focus," said newly elected MEDC Board Vice President Beth Chappell. "Ultimately, that means more jobs." Moreover, "The Michigan Economic Development Corporation will help position Michigan around the globe as a hot business location." "This state's economy has grown to the point where the Michigan Jobs Commission model didn't fit anymore," said newly appointed MEDC President and CEO Doug Rothwell. "The Michigan Economic Development Corporation will allow us to spend more time helping grow the exciting new industries of the new economy, while still providing the same services the Jobs Commission had in place." "The State of Michigan will serve as a model of economic excellence for the rest of the country. Businesses and skilled workers will choose to locate and live in Michigan because of its business climate, quality of life, educational system, technological support, and entrepreneurial spirit. "They will be attracted by the State's self-contained communities or 'technopolises.' Driven by technology, these 'smart' communities will promote and practice the ethic of working, living, and playing in the same place. "Michigan's economic base will continue to strengthen and diversify, with technology as its centerpiece. The State's economy will be increasingly connected to international markets. Well-paying jobs will be plentiful, and skilled and trained workers will be available to fill them." [*] The Workforce Investment Act is itself a fascinating subject for research and writing. For more on the subject, see the Mackinac Center article "Staffing Services Industry Under Fire" at http://www.mackinac.org/4665. John Engler, "Executive Order No. 1999-1," (Michigan Legislature, 1999), http://www.legislature.mi.gov/(S(upauf4qa023wk055ogyhzhba))/documents/publications/executiveorders/1999-ERO-01.htm (accessed July 29, 2009). "Michigan Strategic Fund Act," (Michigan Legislature, 1984), http://www.legislature.mi.gov/(S(rqebc5iqm1l v1wa0xwwn4w55))/documents/mcl/pdf/mcl-act-270-of-1984.pdf (accessed July 21, 2009). Engler, "Executive Order No. 1999-1." "Financial Audit of the Michigan Economic Development Corporation," (Lansing, Mich.: Office of the Auditor General, 2009). "Michigan Economic Development Corp Begins Operations," Michigan Information & Research Service, April 5, 1999. "Strategic Directions for Michigan's Future," (Michigan Economic Development Corp., 1999), 15.